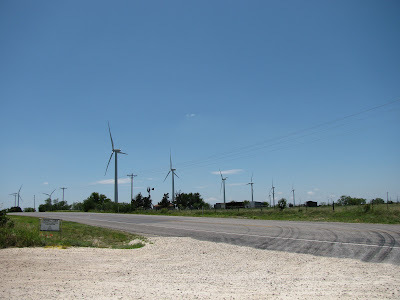 On our trip to San Angelo last weekend, we drove by this wind farm just west of Abilene. You almost need an aerial view to truly appreciate the expanse of this place. There are wind generators as far as the eye can see. 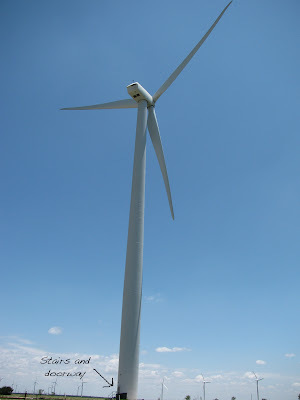 It's called Horse Hollow Wind Energy Center and it's the largest wind farm in the world. These generators are simply enormous! Look how small the stairs and doorway are! I think this is a great source of energy and I hope it is made more widely available in the future. 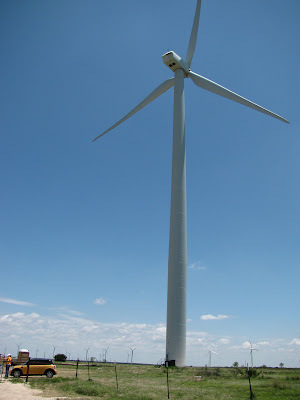 Leigh, when I lived in California, there were two spots that had windmills almost exactly like these. One on Palm Springs and one in the Tehachapi Mountains. I always loved to watch them...they are so facinating! Cool. We have some wind farms in CA too. They are positioned over some of the passes between the bay area and the central valley. But none of the turbines are as big as those. Wow. Amazing. Two of my sons work for GE Wind Power. One did live and work in Tehachapi [we got to visit him for a few weeks when he was on that sight] and also in west Texas as well.